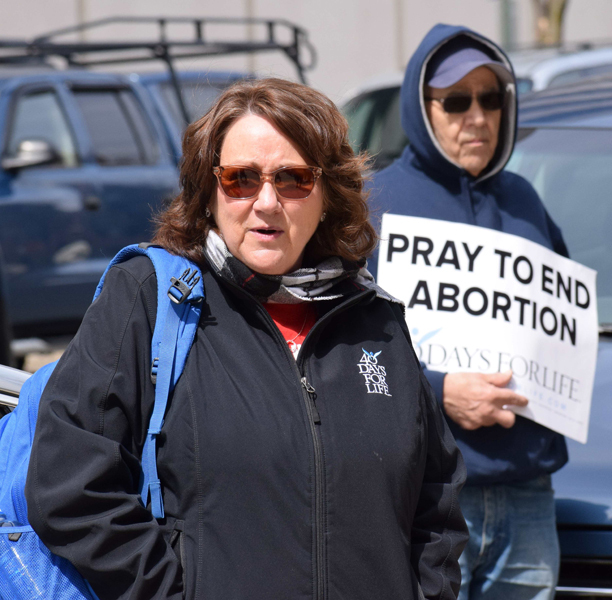 Spring is the season of new life, and therefore the perfect time for Sue Thayer, former Planned Parenthood manager and current 40 Days for Life director of outreach, to bring the message of “the beginning of the end of abortion” to the Lehigh Valley April 2. Thayer shared her story of transformation with approximately 30 people at noon in front of Planned Parenthood, 29 N. Ninth St., Allentown. That morning she spoke at Allentown Women’s Center, 31 S. Commerce Way, Bethlehem. The talks were two of several Thayer gave April 1-4 in Pennsylvania and New Jersey. 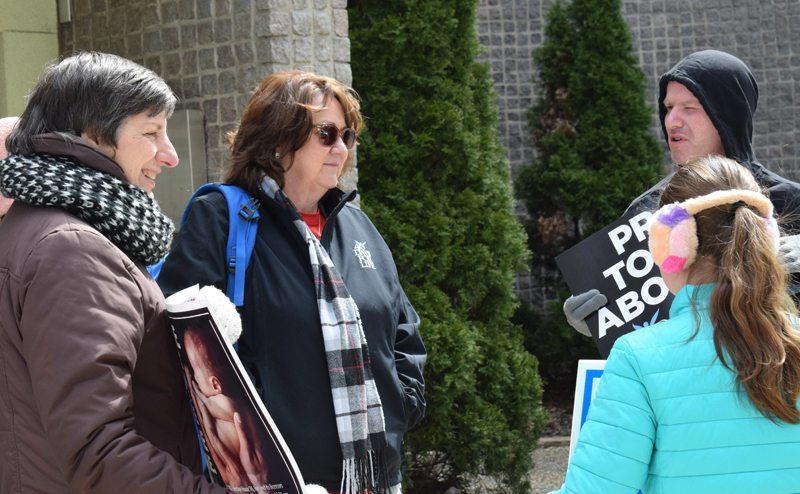 This spring’s 40 Days for Life campaign ran March 6 through April 14. “It’s an interesting story, what God did,” Thayer said of her journey from working for Planned Parenthood to being an ardent pro-lifer, during her lunchtime talk in Allentown. 40 Days for Life is an intensive campaign that focuses on 40 days of prayer and fasting for an end to abortion, peaceful vigil at abortion facilities, and grassroots educational outreach. Since 40 Days for Life began, 15,256 mothers have chosen life for their children, 186 abortion workers have quit their jobs and 99 abortion centers where 40 Days for Life vigils have been held have gone out of business. Thayer worked for nearly two decades at a Planned Parenthood facility in Storm Lake, Iowa. When the abortion giant began selling controversial and dangerous webcam abortion procedures, she spoke out and was fired. Thayer believed she was finally free of the abortion industry, but God had other plans. In 2011 she reluctantly signed up to lead a 40 Days for Life campaign in front of her former workplace. Soon after the Planned Parenthood facility shuttered its doors. No one in the pro-life world has been inside Planned Parenthood longer than Thayer. Having been a center manager for nearly 18 years, she believed she was helping women. But that all changed when she was informed she would soon be trained to do webcam abortions at her small rural Iowa center. Stunned, her concerns fell on deaf ears. She began to see the abortion giant in a new light and ultimately shared her insider’s knowledge. Her vast experience coupled with her changed heart and bold faith has led to a whistle-blower lawsuit, currently in litigation. Thayer led Storm Lake’s first 40 Days for Life campaign at the very clinic she had supervised. Soon after completing the prayer vigil, that Planned Parenthood closed its doors forever. Storm Lake was the first of 21 Iowa Planned Parenthoods to close. Thayer is founder and former director of Cornerstone for Life Pregnancy Center in Storm Lake. She is passionately pro-life with a deep desire that the whole world understand the abortion industry, particularly the evils of webcam abortion. According to Iowa Right to Life, with a webcam abortion a woman goes to a Planned Parenthood where there is no doctor physically present; she consults a doctor only via webcam. The doctor remotely activates a drawer that opens and provides the woman with two bottles of abortion pill drugs. The first pills, which kill the baby in the womb, are taken by the woman in front of the webcam. She takes the other pills home to take later to expel the baby. 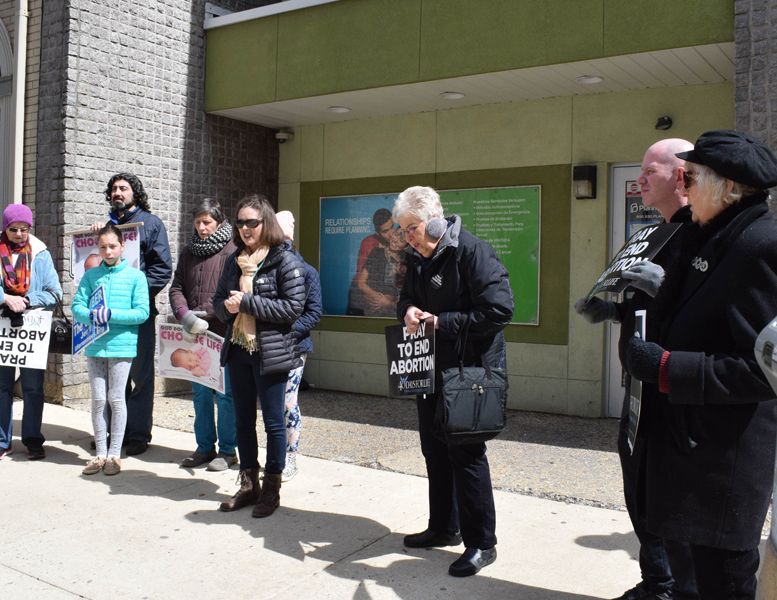 As Thayer spoke to the pro-lifers in downtown Allentown, she explained how she was very vocal with her thoughts against webcam abortion procedures, especially when told nonmedical staff had to do transvaginal ultrasounds. “That was a really bad idea,” she said. When Planned Parenthood fired her in 2008, “It was a relief to know I’d never be part of that,” she said of webcam abortions. To help meet the “goal,” women who came in were told such things as “If you can’t afford $10 for a pregnancy test today, how can you afford a baby?” and workers emphasized the high cost of car seats. “Thirteen weeks and six days is pretty far along – that’s what goes on here,” Thayer said, her eyes focused on the Planned Parenthood building in front of her where abortions are performed until a little over 13 weeks into a pregnancy. But when pro-lifers in her hometown wanted to know what went on at Planned Parenthood, she explained the webcam abortions and how horrible they are. The webcam abortions cause many problems, such as women often wind up in the emergency room with heavy bleeding. “Planned Parenthood doesn’t use the word baby – they say ‘contents of the uterus’ or ‘tissue.’ The ultrasound screen is always turned away with the sound down so you don’t hear the baby’s heartbeat,” Thayer said. “They are not pro-choice, they’re pro-abortion; if they were pro-choice, they’d share information on adoption. “Planned Parenthood is in the business of selling abortions. Sure enough, they had more than enough people, but it took Catholics, Protestants and Evangelicals working together – not an easy task in their small farm community. They complained they didn’t pray the same way. After a bumpy start, the squabbling stopped and they worked together. “I prayed they’d get along. God worked it out,” Thayer said, adding she asked them to pray Psalm 139. “For the next 35 days or so for every minute we had at least two people there.” Today, the churches all work together and get along. Thayer said God answered their prayers that the Storm Lake Planned Parenthood would close, despite the fact that it made a lot of money and had a lease through 2023. “Since then they have just kept on closing. Thayer said God impressed on her the need for a pregnancy center, which became a reality. Thayer and her group found a spot to rent and quickly raised $10,000 “because God’s people are abundant and generous.” So Cornerstone Pregnancy Center in Storm Lake became a reality. Speaking of the movie “Unplanned,” Thayer said she knows Abby Johnson, on whose book the film is based. Now an ardent pro-life speaker, Johnson was a director at Planned Parenthood in Bryan Texas, the college town of Texas A&M. “The movie is very accurate in how they perform abortions. The scenes are very accurate – babies are dismembered in the womb,” Thayer said. “God is really counting on us to be the hands and feet of Christ here. You are planting seeds, you are making a difference,” Thayer told those gathered. “I had typical hardness of heart doing what they do here – selling murder,” Thayer said of Planned Parenthood. To learn more about 40 Days for Life, visit www.40daysforlife.com. Pro-lifers gather in prayer in front of Planned Parenthood. That morning Thayer spoke in front of Allentown Women’s Center, 31 S. Commerce Way, Bethlehem. “I’m excited to know prayer works and God heals,” Thayer says. Thayer chats with members of the pro-life community.